I was traveling this summer and had a chance to visit a number of museum gift shops, which are some of my favorite shops when traveling because the items you find are often quirky, and artsy, and usually not super touristy but still unique enough to feel like you wouldn’t see them in your everyday life. And in one of these shops I spotted some awesome completely amazing magnets that were made out of wooden spheres. I fell in love, and purchased a set of 6 because they weren’t cheap enough to purchase more, but as soon as I got home all I wanted was to populate my life and all of my magnetic boards with these adorable magnets, and so I decided to try making my own. Step 1: Fill the hole. 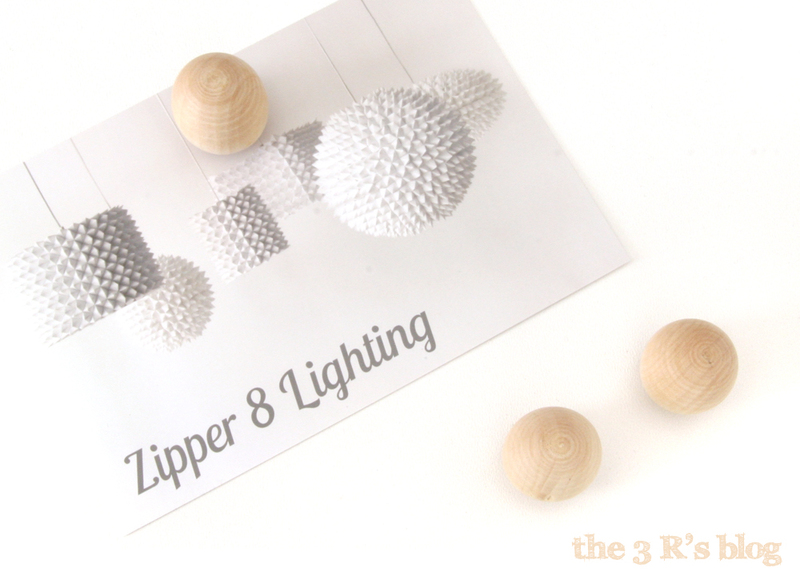 I chose to purchase wooden spheres with holes pre-drilled, meaning I didn’t get to choose the depth of the hole and it was way too deep for my magnets. So I purchased a wood dowel and used it to fill the hole. Insert the dowel into the hole and make a pencil mark at the edge of the sphere, this will measure the depth of the hole. Then use your magnet to mark off the depth you need to leave free to glue your magnet so the top edge of the magnet is flush with the outside of the wood sphere. Use the Xacto blade to cut your dowel down to length. Don’t worry if it isn’t precise – we aren’t factories here, we are people – it probably isn’t going to be precise, just own it and move on. 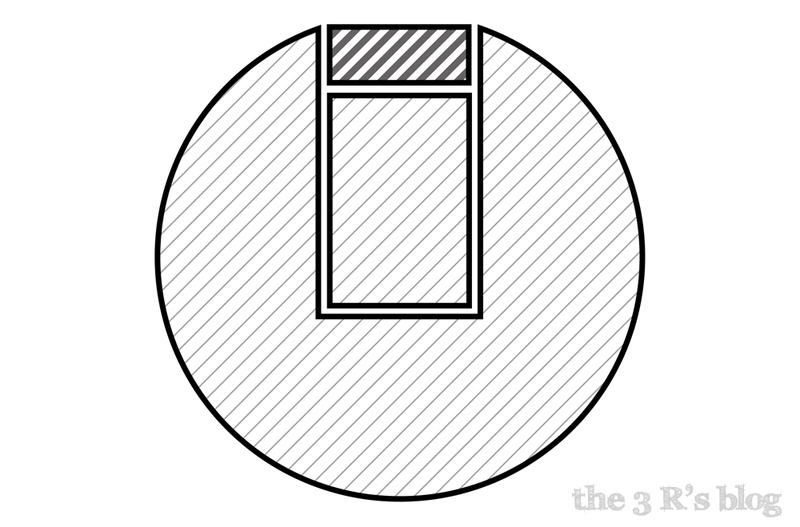 This diagram shows what the finished piece will look like if we cut it down the middle, with the wood sphere, the filler dowel and the magnet on top. Step 2: Glue the dowel in place. 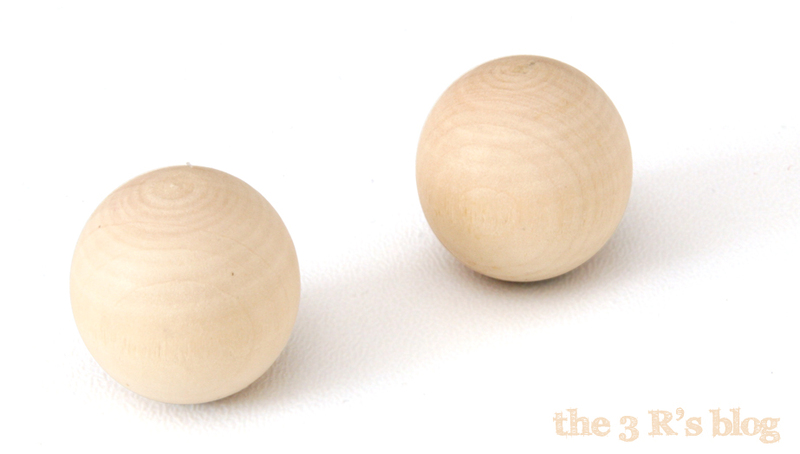 Use a drop of super glue at the bottom of the hole in your sphere to secure the dowel in place. Don’t purchase a dowel that is too large, it is better to have the dowel slide in easily than to worry about getting it precise. No one will see what the dowel looks like once you are finished. Step 3: Glue the magnet in place. This was by far the hardest step, for a few reasons. Dealing with magnets, and especially the super strong rare earth magnets, can be a pain. They are small and difficult to handle with just your fingers, but being, well, magnets, they stick to every tool I have. If anyone out there knows of pliers made of plastic that I could use to hold these magnets and get them into place, please let me know! I chose to use E6000 so that I could get a nice strong hold on my magnets, with their shiny surface they often peel off any glue I’ve tried before, especially hot glue. So, I used E6000 which is very strong but unfortunately takes 24 hours to cure, which means I needed a way to make sure the magnet stayed where I wanted it, which was flush to the outer edge of the sphere so it would make contact with any future magnetic surfaces. However, rarely was my dowel the precise correct height to get the magnet into the perfect place, so I used T pins to ‘hang’ the magnet in place while the glue cured. Basically the magnet stuck to the T pin, and the T pin sat exactly flush with the surface of the sphere, so it meant that the magnet would cure into the glue at exactly the correct height. Why bother with the dowel at all if I was going to hang the magnets off the T pins like this anyway? Because E6000 shrinks when it cures, and its one thing to fill in the fractional space between the dowel and the magnet with glue, its another to fill in half an inch of air with glue. Step 4: Let the glue cure. Ok, I amend my previous statement, thinking back I actually think leaving the glue to cure may have been the hardest step. Because, while the magnets and glue were difficult to deal with, there was also the fact that the spheres were round. (Shocking, I know.) And therefore trying to set them aside to cure with the magnets face up was nearly impossible. They kept rolling away! So to solve this I pulled out a small brownie pan that I’ve used for other non-food crafting, and used the little cups to prop the spheres up while the glue cured. This also had the benefit of keeping the magnets away from each other, since they are so strong they had a tendency to jump to each other if they got at all in the vicinity. Have I mentioned before how much I hate working with magnets? Step 5: Enjoy! I love how rustic yet modern and polished these look. And natural wood is very popular these days. If I was going to do this project for a children’s room I might choose to paint them bright glossy colors so they looked more like plastic, they might even look like gum balls! But for my purposes I am over the moon with the unfinished wood. The wood is very smooth to the touch so you don’t need to paint or varnish or seal them if you don’t want to. You also get to see all the beautiful wood grain. What do your favorite magnets look like? I’d love to hear about them in the comments below. Silicone tipped tweezerish things, those big/;long ones…forceps? If you can’t find them with the silicone tips, you can do that yourself. I wish I had the brand name for you, or a link, but some bright woman who makes jewelry got the idea of coating the tips of her tools so they didn’t scratch precious materials. She came up with a product that consists of a small bottle of silicone which you dip the tips of your tools in to coat them. 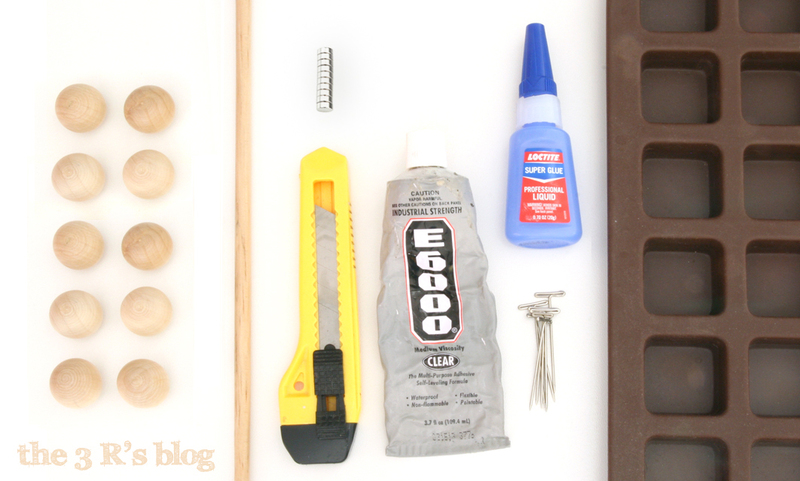 You can find it on most any jewelry tool site or in shops, although, if you have other uses for silicone, you could just buy a can (or whatever) of the stuff to keep in your workshop. i bought some food safe silicone to coat the tips/edges of metal kitchen implements, most notably tongs and turners, so I can use them with my non stick stuff without damaging the surface. I would imagine that the silicone would keep the magnets from sticking unmanageably if not completely. 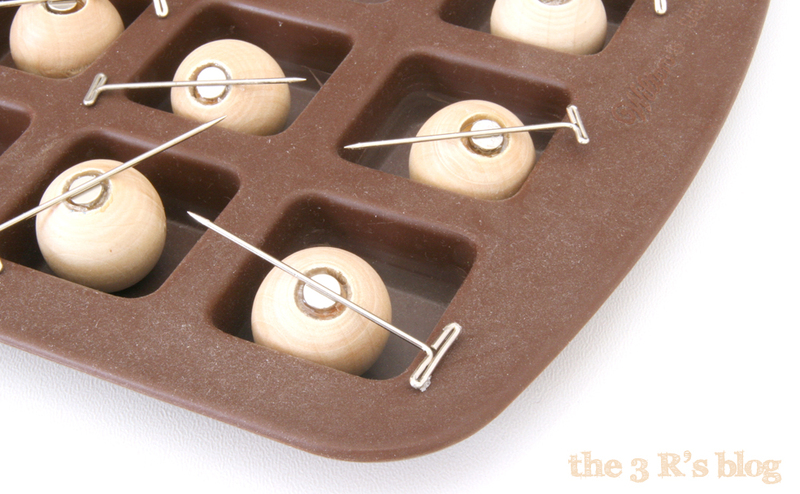 These are nice to use magnets.They have an attractive shape of sphere.I have also used these magnets. It is a really good concept and good use of magnets. Can we make it in different shape?